Starring: Vivek Oberoi, Diya Mirza, Sushant Singh, Mukesh Rishi, Govind Namdeo, Vivek Shauq, Neena Kulkarni and Atul Kulkarni. Saathiya, three names from the year 2002 which Bollywood has to still get over with and once again 2003 starts of with another much anticipated Vivek Oberoi starrer "DUM". Going by the pre-release buzz and interviews of Vivek Oberoi and Atul Kulkarni, it was clear that DUM´s treatment is going to have its share of commercialism and mass appeal. However going by Vivek Oberoi´s track record to date and the earlier ventures of director E.Niwas, we did have certain level of expectations of a hard hitting drama with a dose of realism. Produced by Cineyug, the movie was also highly anticipated for the face-off between Vivek Oberoi and Atul Kulkarni who are two of the most talented actors in recent times. So does this movie have the DUM to live up those expectations? Probably, you guessed it! 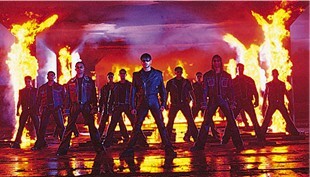 The movie starts off with Vivek Oberoi(Uday Shinde) and his friend Mohan(Sushant Singh) displaying their complete determination to join the police-force with all the noble intentions of dedicating themselves for the country. Being from a lower middle class family, both of them get selected for the training based on their credentials rather than recommendations, thanks to the police-selection academy officer (Mukesh Rishi) who also serves as an ideal for the two youngsters. Amidst all the enthusiasm and zeal of getting selected for the training, Uday gets into a confrontation with a sadistic cop, Atul Kulkarni (Encounter Shankar). Not just the common man but even Uday´s own ideal (Mukesh Rishi) have witnessed the selfish and evil side of Shankar and suggests Uday to concentrate on his goal of becoming a police officer and dealing with the evil side of society a la Shankar using the law. However,Uday is only left to be treated with the evil side of the egoistic Shankar and soon with all the might and political connections, Shankar gets his hand on Uday and treats him with third-degree, only to satisfy his ego. What happens next, is just another run of the mill story where Uday and Shankar try to outdo each other and come over the top. The director also stresses the importance of self-determination and willingness in every individual if he has to come out successful and he has to find it within himself. It is the second half where the essence is lost as it becomes another cat and mouse game and though the second half is not as horrendous as seen in Road (another Vivek starrer), the increasing interest provided by Bunty Soorma´s story in the first half up to the interval point is lost. At the end, it is just another tried and tested formula and no matter how many talented actors you have, the viewer is bound to leave without complete satisfaction. The movie bears a lot of resemblance to Cineyug´s own Sunny Deol starrer "Arjun" and has some shades of Nana Patekar starrer "Yeshwant". Also the movie has a lot of unnecessary violence and some, over the top which pretty much takes away the dose of realism which was the scoring point in "Shool" by E. Niwas. "Babuji" Some might feel that this critic is stretching the criticism a bit too far. Well let me say this, this criticism is compared to movies like Company (Vivek´s debut) or Shool (directorial debut of Niwas) and not to the recent junk that has been churning out of Bollywood. On the positive side, Niwas does display his command over the subject and though it seems he has taken over the tasks after the unfortunate demise of Bunty Soorma, he shows why he is considered such a talented director. It is the script that lets him down a little bit. However, his touch is evident in all the confrontation scenes between Vivek Oberoi and Atul Kulkarni. From Shool to Love Ke liye Kuch Bhi Karega to Dum, he has tried something different every time and here he also has been able to extract great performances from his cast. He has done very well in picturizing the action scenes, especially the final fight and gets good support from action coordinator Abbas Ali. The interval scene at the railway track is pretty engaging and so is the first confrontation scene between Vivek and Atul. The chase scenes are nail-biting and they remind some of the work of his mentor Ramgopal Varma in "Shiva". The screenplay by Niwas himself and Mehran is clearly lacking the effort and more so it seems to be amalgamation of many previous Hindi movies. The cinematography by Surendra Rao is good and is well captured as seen in many songs, especially the title song and "Jeena". Choreography for the title song and "Jeena " are good and enjoyable. However the other songs were not needed, as they only hinder the pace of the movie, not to forget the vulgarity at the highest level in "Babuji" song. The background score of the movie is very good. Moving on to the performances, the movie belongs to both Vivek Oberoi and Atul Kulkarni. Even if Vivek´s character has been seen many times before in Hindi cinema, he gives it everything and with this he comes a full circle. Some of his dialogue delivery and body language, reminds a lot of another great actor Anil Kapoor, in his earlier days of Mashaal. From the gangster Chandu Nagre in Company to the next door boy Aditya Sehgal in Saathiya and now the macho man Uday Shinde, Vivek displays his versatility. One thing is evident even here as seen in his earlier movies, Vivek understands the ethics of acting and has a defined approach to every character. His sensitivity at Sushant´s death or his rage when he finds out about Atul assaulting his father or his tenderness when admitting his love to Diya Mirza all just prove his all-round acting credentials. Not to forget, he doesn’t stay behind when it comes to moving his feet and body to the choreography of Ganesh Hedge. His fan following might have increased n-fold after Saathiya, but here he might just be able to increase some of the fan following which has been loyal to Sanjay Dutt and Sunny Deol all these years for playing the macho-men in Bollywood. Atul Kulkarni, another one of those with unlimited talent and with 2 national awards under his belt (Hey Ram and Chandni Bar), does complete justice to a role written with only him in mind. Granted the role doesn’t have as much depth and as many dimensions as Potya Sawant in Chandni Bar or Sriram Abhyankar in Hey ram, he plays Encounter Shankar with complete ruthlessness and looking at the way the role was defined, he really makes you hate him when he is on screen. It’s been a while that we have seen such a terrific performance as a villain in Bollywood. There are several sequences where he manages to overshadow Vivek with his trademark dialogue delivery and facial expressions. With the intention of making his foray into commercial Bollywood movies by playing a complete "filmi" and eccentric character that holds tremendous mass appeal, he scores and scores well! Diya Mirza, looks gorgeous and though this is not saying much, but she definitely has performed much better than her earlier movies like Deewanapan. Granted she doesn’t have as much to do in a flick dominated by male actors, she does have her moments. Her introduction scene made me feel that I am actually watching Aishwarya Rai on the screen. Sushant Singh´s role starts of well in the beginning as the good friend of Vivek, but eventually is wasted in another one of those roles where he has to sacrifice for his friend. After scoring well in Rajkumar Santoshi´s The Legend of Bhagat Singh, he does perform well in the initial scenes, but we had expected more. Same happens to Mukesh Rishi, where his introduction scene creates all the interest, but he doesn’t have much to do in the second half apart from providing the "direction" required to Vivek Oberoi. Whatever lines he has, he delivers them superbly and as a viewer you want more of him, rather than some vulgar songs thrown in. filmi character "Babu Kasai" and has nothing to do except some over the top action. The change seen in his character towards the end is laughable for all the wrong reasons. Neena Kulkarni and Govinda Namdeo are wasted as what can be called typical "filmi roles of mother and a politician. Overall, the movie does have good moments and will easily find some following as it has the man of the moment, Vivek Oberoi. It is the run of the mill script which is the major let down and when compared to Ramgopal Varma´s "Company" or with the expectations of another hard hitting movie from E.Niwas, it is a disappointment. However if you want to see Vivek Oberoi and Atul Kulkarni and their face-off, look no further. Just got for it! You will agree with me that, Vivek Oberoi does have "DUM".